JD Caudill is a Chicago-based director, music director, and performer. Since coming to Chicago in 2014, JD has performed onstage with The New Colony, Hell in a Handbag Productions, New American Folk Theatre, Forks and Hope, and Hobo Junction, and directed for over 15 companies, including Broken Nose Theatre, The New Colony, and Haven Theatre. 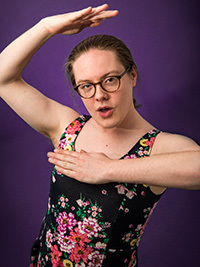 JD is a company member of Hell in a Handbag and Haven Theatre (where they are also marketing director), and an associate company member of Broken Nose Theatre. Chicago theatre credits include: Women Laughing Alone with Salad (Theater Wit); At the Table (Jeff Award - Best Ensemble, Best Supporting Actress; Black Theatre Alliance Award - The Hattie McDaniel Award) Broken Nose Theatre; The Crucible, Between Riverside and Crazy (U/S) Steppenwolf Theatre; Short Shakes! Romeo and Juliet (U/S) Chicago Shakespeare Theater; A Comedical Tragedy for Mister Punch, United Flight 232 (Jeff Award - Best Ensemble) House Theatre of Chicago; Don't Go Gentle (Haven Theatre); Balm in Gilead (Griffin Theatre). 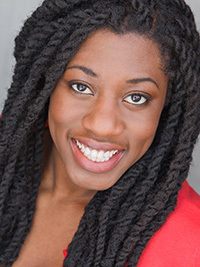 She is a graduate of The School at Steppenwolf and is represented by Grossman and Jack. Michael Turrentine is an Actor/Educator/Playwright originally from Oklahoma, but loves the Windy City too much for words! He has worked at various Theaters around the City including Firebrand Theater, Remy Bumppo Theatre, Theater Wit, The Lyric Opera of Chicago, The Gift Theatre and others. He will also be performing in the up-coming production of Frankenstein at Remy Bumppo Theatre. Michael is excited to go on this cool and exciting journey with Interrobang! He would also like to thank his family, especially his Mom, for their undying support. Michael is represented by Gray Talent Group. Joe Lino is a Chicago based actor and has worked with Steppenwolf, Goodman, Victory Gardens, Teatro Vista, Drury Lane, The New Colony, The Cuckoos Theater Project, The Agency Theatre Collective and Interrobang Theatre Project where he is an artistic associate. Regionally, he has credits with Actors Theatre of Louisville in shows such as Dracula, A Christmas Carol, and That High Lonesome Sound, which premiered at the Humana Festival. He has also performed Off-Broadway at the BAM Harvey Theatre in Charles Mee’s world premier of The Glory of the World. He is a proud alumni of Ball State University. Chirp chirp. David is the Artistic Director and Co-Founder of Hell in a Handbag Productions. Plays written include Rudolph the Red-Hosed Reindeer, SCARRIE! The Musical, POSEIDON! An Upside-Down Musical, Christmas Dearest, The Golden Girls: The Lost Episodes Vol 1 & 2, and The Birds. As an actor he has worked with A New Colony, Corn Productions, LookingGlass, A Red Orchid Theatre and more. Cerda was inducted into the Chicago 2016 GLBTQ Hall of Fame and received a Lifetime Achievement Award from the Chicago Jeff Committee in 2017 for his body of work and philanthropic efforts. Shawna is the founding managing director of Facility Theatre where she is currently performing in the Chicago premiere of Phoebe In Winter by Jen Silverman. She originated the role of Dottie in Killer Joe by Tracy Letts at The Next Lab in Evanston. She performed this role at The Traverse Theatre in Edinburgh, The Bush Theatre in London, and The Vaudeville Theatre in London's West End. She also performed in Grand Concourse at Steppenwolf Theatre and The Woman Before at Trap Door Theatre. She has appeared in various productions in Dublin, Los Angeles, Phoenix, and New York City, and is the founding artist director of Space 55 Theatre in Phoenix. Owa’Aìs is excited to play tonight. He is a Chicago native and is a proud ensemble member of Definition Theatre Co. Theatre credits include: The Invisible Hand (Steep Theatre, Milwaukee Rep), The Hard Problem (Court Theatre), Orange (Mixed Blood Theatre), The Qualms (Steppenwolf Theatre). When he’s not acting, Owa’Aìs loves cooking and is a self proclaimed mixologist.